World War I was the first time aeroplanes were deployed for warfare. The then rickety flying machines fought crucial dogfights as both sides struggled for air supremacy. Flying aces like Manfred von Richthofen, aka The Red Baron, won fame and glory for their aerial expertise. 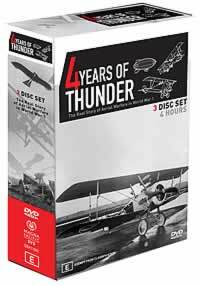 Four Years of Thunder reveals, for the first time, the inside story of the air war in World War I with the use of some of the most stunning and authentic footage ever assembled.